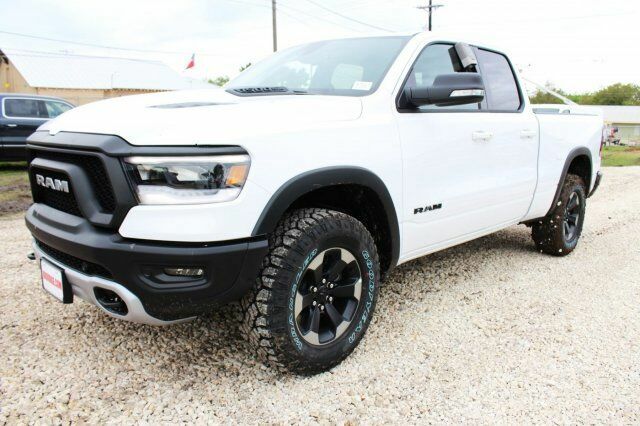 Turn heads in this new redesigned bright white 2019 Ram 1500 Rebel Quad Cab 4x4 pick-up with a heavy duty 5.7L V8 HEMI engine & smooth 8 speed automatic transmission at a great deal! This loaded RAM features a luxurious black & red interior, a touch screen, SIRIUS XM radio, MP3, UConnect, power seats, back-up camera, "Rebel" grill, premium black rims, Alpine speakers, moonroof, & more. If you have any questions about this amazing find or any of our other vehicles, please call our sales office. Thank you for your interest & we look forward to hearing from you.